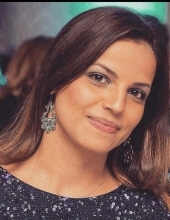 Denise Braga (Simao) Graca, 36, passed away, peacefully, at her home in Union, on Saturday, November 24, 2018 with her loving family by her side. She was born in Jauru, Mato Grosso, Brazil and came to the United States in 1998, resided in Newark, NJ before moving to Union in 2003. Beloved wife of Nuno Cardoso Graca; daughter of Milton and Selma Simao; devoted and loving mother of Anthony, Samantha and Dylan; sister of Lay’s Simao; daughter in-law of Julio and Lucilia Graca; also survived by many dear aunts, uncles, brother-in-laws, sister-in-laws, cousins nieces and nephews. The Funeral Mass for Denise will be offered on Wednesday, November 28, 2018 at 10 am at Our Lady of Fatima, Elizabeth. Interment to follow at Holy Cross Cemetery, North Arlington, NJ. Relatives and friends are welcome to attend. The visitation for Denise will be on Tuesday, November 27th from 6– 9 pm. In lieu of flowers, donations to Denise’s Children’s Education Fund would be graciously appreciated. To donate go to Venmo @nuno-graca. To send flowers or a remembrance gift to the family of Denise Graca, please visit our Tribute Store. "Email Address" would like to share the life celebration of Denise Graca. Click on the "link" to go to share a favorite memory or leave a condolence message for the family.